Do you know the psychological impact of the words in your Facebook Ads? Did you know certain words cause certain responses in their reader? This third and final part of my three-part series – The Psychology Behind a Successful Facebook Ad – takes a look at text. I’ll examine five specific words that will get you results, dive into the role of emotionally charged words in advertising, and how brand names and dollar values can fit into your Facebook advertising strategy. I’ll also give you real-world examples taken from Facebook and give you concrete strategies on how you can use the information you’ll learn. What is text psychology and why should I care? Text psychology is the study of a word’s effect on a person. Certain words can create both physiological and emotional reactions – something that can be very useful in online advertising. With the right word, a savvy Facebook advertiser can grip a Facebook user, communicate an idea, encourage an action. For example, when Eric Siu from TreeHouse (an online coding resource) found that his ad CPA (cost-per-action) was floating around 60 dollars, he added the word ‘Free’ to his ads. His CPA dropped by 17 dollars per signup. Words have two ‘meanings’: denotative and connotative. Denotative is the dictionary’s definition of a word, whereas a connotative definition is far more complex, and far more interesting for advertisers. Consider the word ‘mother’. Denotatively, the word ‘mother’ simply means ‘a woman in relation to a child to whom she has given birth’. Connotatively, it means and evokes so much more in each one of us. Words and phrases like ‘Free’, ‘Coca-Cola’ ‘Last chance’ ‘Save’ are heavy with connotative meaning. Facebook advertisers can anticipate these responses and tap into that knowledge to increase the effectiveness of their ads. Facebook users like being the center of attention, and they like the idea that a product is built for them, focused on them. Think about it, if I’m selling a product that promises to double ROI in 12 months you might be interested. If I’m selling a product that promises to double YOUR ROI in 12 months, you will definitely be intrigued. ‘You’ is also the most attention-grabbing word available. This is because it’s as near as we can get to calling people by name (though re-targeting is getting pretty close with that as well.) Again, let me give you a hypothetical: you’re in a crowded room with 50 other people. Someone enters and yells ‘hey you!’ indiscriminately. How many people do you think would turn? Something to Ponder: Landing-Page-Optimization site Unbounce.com has recently had some interesting results A/B testing their own landing page. Despite their hypothesis, they found that the phrase ‘get my free 30-day trial’ had a 90% better click-through-rate than ‘get your 30-day trial’. Long story short, test out your own text to see which your audience prefers. The culture in which we live is one where people want ‘new’. This is especially true of Facebook users – 78% of whom are on their new mobile phones.They want the next big thing. They want it before anyone else, and if you can give it to them they’ll keep coming back. It’s vital, though, that what you’re advertising as ‘new’ actually is. Techno-savvy Facebook users can tell in seconds whether they’ve seen your product before. As a result, it’s important that you highlight quickly exactly what’s new about your product within the Facebook Ad’s landing page. I also recommend the word ‘New’ when targeting your business’ existing contacts or CRM. If you have a new product you’d like to release, promote it to your previous customers first. They’ll be most excited about a new product, because they’ve clearly liked your previous ones. 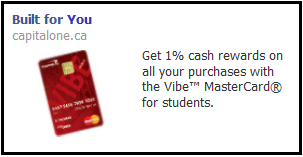 People like to save, and Facebook Ads are a great place to offer coupons and discounts. In fact, I recommend advertising your product almost exclusively with a discount or deal on Facebook, as discounts are one of the best value propositions and will increase your click-through-rate. The word ‘Proven’ is extremely effective for technology, software, and for businesses with small brand awareness. Until your product is proven, you’ll struggle to encourage people to use it. Facebook users (more than any other advertising audience) are influenced by social endorsement. They click because their friend clicked or ‘Liked’. 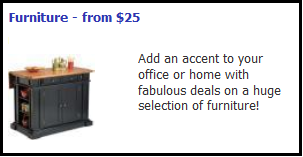 This kind of socially endorsed advertising is what sets Facebook Ads apart. But the word ‘proven’ accomplishes something similar. The word ‘proven’ is heavy with meaning. We recognize it as a valuation of the product. In many ways the word ‘proven’ acts in the same way as a trust symbol, which have been known to increase landing page conversions by up to 165%. People are far more likely to act if they know someone else has done so before, and has not lost out. Proven savings of 20% over 12 months. Find out how! One of the most powerful words in advertising (second only to ‘you’ in my opinion), ‘Free’ is the ultimate value proposition. It’s the epitome of getting your money’s worth, something at the forefront of every consumer’s mind. Offering something for free is why contest marketing works so fantastically. The word ‘Free’ has been known to increase conversion rates by 28% and decrease CPA by 35%. So keep it in mind. As you can tell from HootSuite’s Facebook Ad below on the right, you don’t even necessarily need to back up your eye-catching words (I’m not sure if $8.00 is the same as Free guys…). Though I’d recommend it. For more on using the word ‘Free’ in your Facebook Ads and online marketing, read my articles 7 Value Proposition Formulas to Boost Conversion on Ads and Landing Pages and How to A/B Split Test your Facebook Ads to Maximize ROI. Using language to evoke a feeling is an incredibly effective strategy for advertising, as people respond far more to their own emotions than they do direction from a corporation. Think about the effectiveness of charitable advertising, evoking pity in the viewer and encouraging them to take steps to change what they’re seeing. Or the power of the iconic Old Spice commercials, using humor to encourage their brand persona and brand recognition. Using fear is the most often and reliable emotion to use in Facebook Ads. The primary use of fear in advertising is to encourage people to act now, while they have the opportunity. People don’t want to miss out on a chance to save money or access something exclusive or temporary. I highly recommend you periodically make a product or ebook exclusive or on sale simply to create the impetus people need to act. Shopify, below, uses the often-used and reliable ‘don’t miss out!’ to grab the attention of Facebook users and encourage them to click. Brand recognition is one of the simplest and most effective forms of advertising. This article has talked about the connotative value of words – the idea that comes with a word. As a social media marketer and blogger, I spend most of my day encouraging the reputation of Wishpond as a reliable source of information, with great digital marketing tools that people trust. As such, when our Followers, customers, or readers see the Wishpond logo or one of our articles in their Google search they know the information will be valuable, simple-to-understand, and reliable. It’s the same in Facebook advertising. Provided you’ve spent time and energy (and read Wishpond’s articles on increasing brand awareness) your brand name will be as eye-catching as the word ‘Free’, and have far more connotative meaning. Gillette’s Facebook Ad, below, features its brand name three times. Money has more connotative value than, arguably, anything else. In our consumerist culture we see money and we see the things we could buy with it, not the note itself. We see new shoes, a college fund, our next holiday, supporting our family. So of course we’re going to respond emotionally to dollar signs in advertising. They’re a symbol for a million different and desirable things. This concludes my three-part series on the psychology behind a successful Facebook Ad. I’ve gone through the psychology behind different colors, how images impact us emotionally, and what text works best in advertising, and why. Hopefully, from this article, you’ve gotten some ideas for your next Facebook Ad. Try to incorporate everything these three articles have discussed: Use the color red, an image of a smiling-woman and the headline ‘Don’t miss out!’ to encourage click-through. Try the color purple, an image of a crying child, and the headline ‘Do you deserve a break’ to target mothers for a spa giveaway. Have you found a particular word or phrase works well for your business? 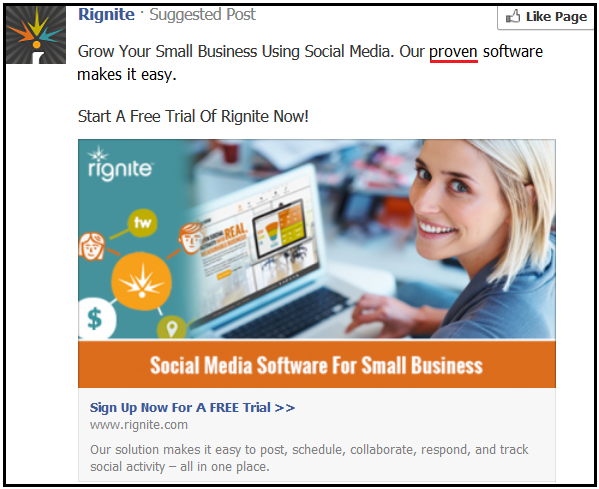 Have you A/B tested the word ‘Free’ on your website or in your Facebook Ads? Start the conversation below.